Anguish, alienation and grief characterise the life of Edvard Munch, Norway’s greatest artist. ‘Sickness, insanity and death were the dark angels standing guard at my cradle and they have followed me throughout my life.’ Munch made this stark evaluation of his cursed existence in his 70th year, and in large measure the statement can be taken as a vindication of the gloomy and disquieting themes he felt compelled to explore so relentlessly in his art. Born into a highly cultured family of reduced circumstances in Kristiania (now Oslo), Munch’s childhood was marred by a number of tragedies: his mother died of tuberculosis when he was five years old and his older sister perished as a result of the same malady nine years later at the age of 15. His father, a fervent Lutheran, believed the calamities that had befallen his family were signs of God’s punishment and he succumbed to bouts of extreme melancholy and hallucination. Alienated by his father’s fundamentalism but nevertheless deeply attached to his family, Munch gravitated to the bohemian, anti-bourgeois circle of artists and writers in Kristiania in the 1880s, during which time he was also enrolled as an art student and exhibited his earliest paintings. Munch’s artistically formative years took place in Paris in the late 1880s and Berlin in the 1890s. In Germany he began to make a name for himself and became involved with the Jugendstil publication Pan, which actively promoted the graphic arts. In 1895 the magazine’s co-founder, Julius Meier-Graefe, published a portfolio containing eight drypoints and etchings by Munch. The set included Two human beings (The lonely ones) (opposite, below). The mood of existential loneliness is rendered all the more poignant by the presence of a man and woman staring together out to sea at the rocky beach at Åsgårdstrand, yet physically and psychically separated from each other. Munch’s early prints are pervaded with the imagery of his paintings, and no painting was the subject of more obsessive reinvention than the canvas he completed in 1886 titled The sick child. Munch was haunted by the distressing memory of having witnessed his sister, Johanne Sophie, waste and die of tuberculosis in 1877. This experience, along with his encounters with the sick during house calls with his doctor father, provided the inspiration for the picture. Years later Munch wrote: ‘In the sick child I opened for myself a new path – it was a breakthrough in my art. Most of what I have done since had its birth in this picture.’ The original picture was followed by five more painted versions, the last completed in 1927. 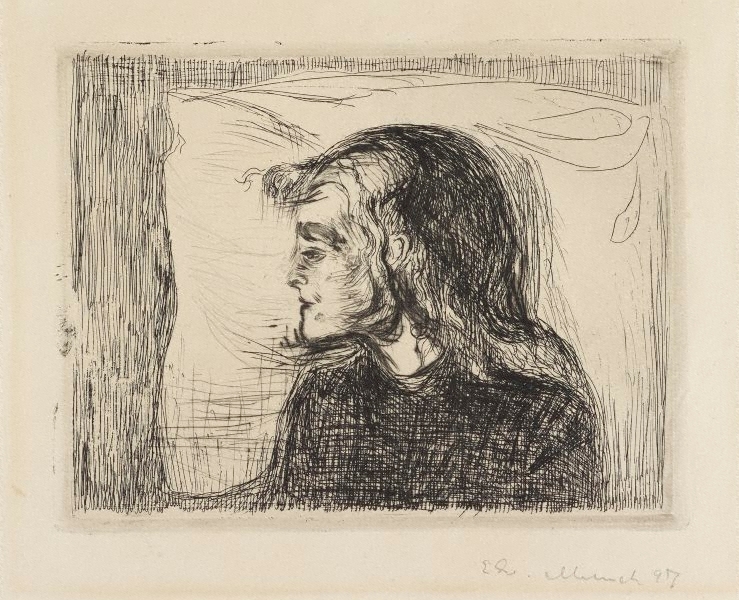 About a decade after completing the prime version, Munch revisited the subject of the sick child through the medium of printmaking: the drypoint made in 1894 is closest to the painted composition, with the feverish girl shown propped up against a pillow in a large armchair while a grieving older woman holds her hand. Two more variants followed in 1896: the etching (opposite) and the lithograph. In both prints the composition is drastically reduced to focus all attention on the pain and exhaustion in the child’s face. Arguably, these are Munch’s most psychologically compelling – and confronting – renditions of the subject. Munch was a tireless experimenter, fascinated by printmaking’s unique capacity to produce differentiated impressions of the same image through the use of coloured inks, as well as conventional black and white. In the etching printed in black, the image is pared down to the barest of essentials. Feverish lines delineate the child’s head and shoulders and capture her tired eyes and trembling lips. Scratches of drypoint along the contour of the girl’s profile accentuate her emaciated paleness against the white slab of a pillow. Another subtlety, seen in fine early impressions, is the ‘foul biting’ whereby the acid leaves pockmarks on the surface of the copper plate (evident on the girl’s cheek), quite literally conveying the corrosiveness and dissolution wrought by disease. Signed and dated l.r. sheet, pencil "Edv. Munch 97". Bruce James, Art Gallery of New South Wales handbook , 'Western Collection: Works on Paper', pp 78-92, Sydney, 1999, illus p 84. Prints in Germany 1880-1940 , Sydney, 1989, p 6. Prints & drawings Europe 1500-1900 , Sydney, 2014, p 180, col illus p 181.